The Dragonbone Chair, the first volume of Memory, Sorrow, and Thorn, was published in hardcover in October, 1988, launching the series that was to become one of the seminal works of modern epic fantasy. Many of today�s top-selling fantasy authors, from Patrick Rothfuss to George R. R. Martin to Christopher Paolini credit Tad with being the inspiration for their own series. 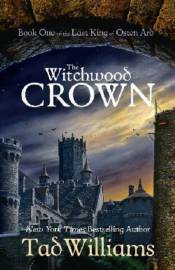 Now, twenty-four years after the conclusion of Memory, Sorrow, and Thorn, Tad Williams returns to his beloved universe and characters with The Witchwood Crown, the first novel in the long-awaited sequel trilogy, The Last King of Osten Ard. With a cast of hundreds - humans, giants, dragons, trolls, Sithi and Norn - The Witchwood Crown is epic fantasy as it used to be: classic, grand and sweeping and evidence that Tad Williams is the greatest living writer of the form.